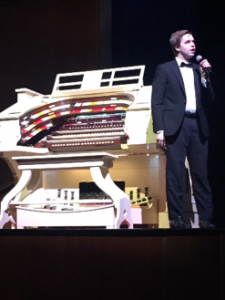 Scottish born David Gray gave a spectacular performance on April 29 as the Dickinson Theatre Organ Society (DTOS) continued in its 47th concert season. A self proclaimed “organ nerd,” David touted that he spent the previous day touring the organ chamber identifying all of the pipes. 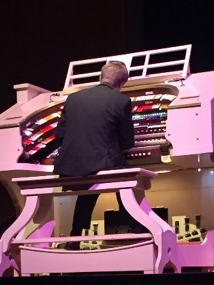 He also spent several days playing several other great organs in the area, such as the Wannamaker Organ in Philly and the “largest organ in the world” at Boardwalk Hall in Atlantic City. In three days, David played 1,040 ranks of pipes – an impressive accomplishment! He declared, though, that there are few more satisfying instruments to play than the mighty Kimball. This was his second appearance with the DTOS. Just before the show, I personally witnessed the 28 year old David run down the aisle of the theater and leap onto the stage. If he was, indeed, that full of energy, we were in for a real treat. And full of energy he was! 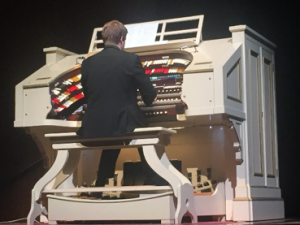 David opened the show with Haydn Wood’s The Horse Guards: Whitehall, followed by The Boy Next Door, a waltz from Meet Me in St. Louis, highlighting the tibia sounds of the organ. Planning to use all of the effects of the organ, David next featured the orchestral sounds with a Sidney Torch piece, Going for a Ride, quickly followed up by a real toe tapper, The Bugle Call Rag. This guy just can’t sit still – constantly moving all around! Amazing energy! To highlight the “ooze factor,” the lush, quiet colors, he played Jule Styne’s People from Funny Girl, originally performed by Barbara Streisand. We were then entertained with a Duke Ellington medley, including Take the ‘A’ Train, Sophisticated Lady, Caravan, Satin Doll, I Got it Bad, Mood Indigo, and It Don’t Mean a Thing, followed by an ‘A’ Train reprise. Next, David delighted the audience with Ol’ Man River, from Showboat (1936) and a favorite of DTOS’ Carl Black (by request), a song that David did not know and learned only 1 hour before the concert by listening to YouTube. I must say that for not knowing the song, he certainly seemed to have mastered it! He rounded out the first set with his “party piece.” According to David, only a few organs can handle this piece – Gustav Holst’s Jupiter from The Planets, Op. 32. 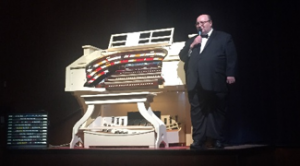 For the second part of the show, DTOS President Bob Dilworth provided the audience with the opportunity to see a part of the organ that is usually hidden. There are so many stops for the organ that there is not enough room on the console for the stop tabs. Remember that this is the 4th largest theatre organ in the world! 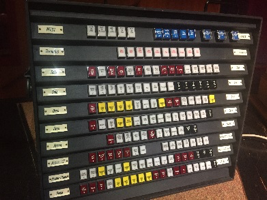 An additional “box” containing over 100 lighted stops tabs was created for the organist to use to access additional voices on the organ to complement the well over 300 stop tabs on the console. As the combinations of stops are changed, the lights go on and off. Knowing that David uses so many different combinations throughout his performance, DTOS thought it would be fun to allow the audience see the “light show” coming from the box. David started the second set with Duke Ellington’s (1944) I’m Beginning to See the Light, quite appropriate as the lights coming from the box danced with each combination change David made, followed by Johnny Green’s 1926 jazz standard Body and Soul. David termed the next selection an “Octopus Arrangement,” meaning that he could use a few extra hands to make so many combination and stop changes as he played John Philip Sousa’s Nobles of the Mystic Shrine. Then it became time for some good ‘ole fashioned theatre organ music, featuring selections from Gershwin’s Shall We Dance, including Shall We Dance, They All Laughed (at Christopher Columbus), Let’s Call the Whole Thing Off, They Can’t Take That Away, Slap That Bass, and (I’ve Got) Beginner’s Luck. David is often asked if he can play classical organ music and his mantra is that popular music shall never be played on the piano and classical music shall never be played on a theatre organ. But he quickly created a few moments of some classical music as he announced he was taking us to church, but he suddenly changed into a fun rendition of The Stripper! The audience was treated to a beautifully quiet and contemplative folk tune from the UK, A Fantasy on Greensleeves, featuring the colorful ranks of the organ leading up to the full use of the strings and featuring the “Egyptian Horn,” which sounded like a vox humana en chamade. He then transitioned to a re-creation of George Wright’s 1958 Cherry from Flight to Tokyo. He ended the second set with a medley of John Williams pieces from popular films such as Hook, Jurassic Park, Schindler’s List, Harry Potter, Jaws, and Star Wars, switching between keyboards, stop changes, piston controls – his hands never stopped moving – and with “more key changes than a cheap motel!” The audience responded with a roaring standing ovation. He ended his performance with an encore, featuring a quick intro to God Save the Queen, followed by Fats Waller’s 1929 Minor Drag. It was an amazing performance by a fully entertaining and energetic artist. Following the performance, DTOS hosted a reception on stage with David. As I mixed and mingled with the guests, everyone commented as to how much they enjoyed the concert and David’s energy that he brought to DTOS.